cruise Main Street with Mickey. 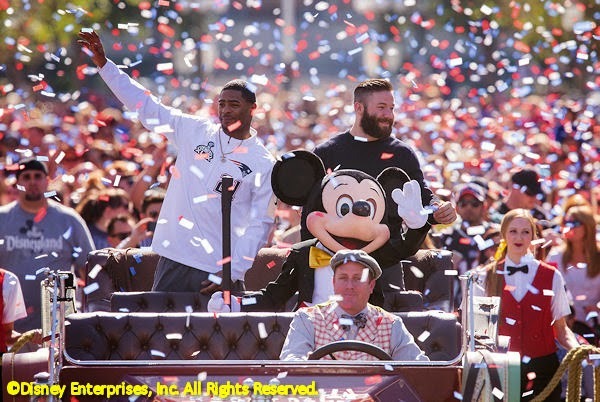 New England Patriots star players Julian Edelman and Malcolm Butler were feted on Main Street, USA at Disneyland Monday after appearing in the traditional "I'm Going to Disneyland" commercial following Super Bowl XLIX. Edelman caught the touchdown pass that gave the Patriots the lead for good and Butler made the goal line interception against the Seahawks in the closing seconds that secured the win. Edelman and Butler were given a ceremonial ride down Main Street accompanied by Mickey Mouse and were showered with confetti as fans cheered them on. This was the 48th time the "I'm Going to Disneyland/Walt Disney World" promo has been aired. It has traditionally followed major entertainment and sporting events (especially the Super Bowl) since 1987 when New York Giants quarterback Phil Simms first uttered the famous line following Super Bowl XXI. Anthony and I talk about the Super Bowl, Disneyland and a few other things in this week's edition of Inside The Mouse Castle. We got a new look at Tomorrowland during the Super Bowl. The sci-fi action-adventure starring George Clooney, Hugh Laurie and Britt Robertson opens May 22nd. Chris Pratt (Guardians of the Galaxy) and Chris Evans (Captain America: The Winter Soldier) made a little Super Bowl bet about who was going to win the game. And it really didn't matter who won after all because, in a classy move, both guys have agreed to pay up. Pratt will visit Christopher's Haven, a cancer care center for children in Boston dressed as Star-Lord while Evans will visit Seattle Children's Hospital dressed as Captain America. You guys are awesome! Honoring the best in animation, the Annie Awards were handed out Saturday night in Los Angeles. How to Train Your Dragon 2 and Disney Mickey Mouse were the big winners, but we loved the special award presented to the Walt Disney Family Museum and the tipsy acceptance speech given by Gravity Falls creator Alex Hirsch. 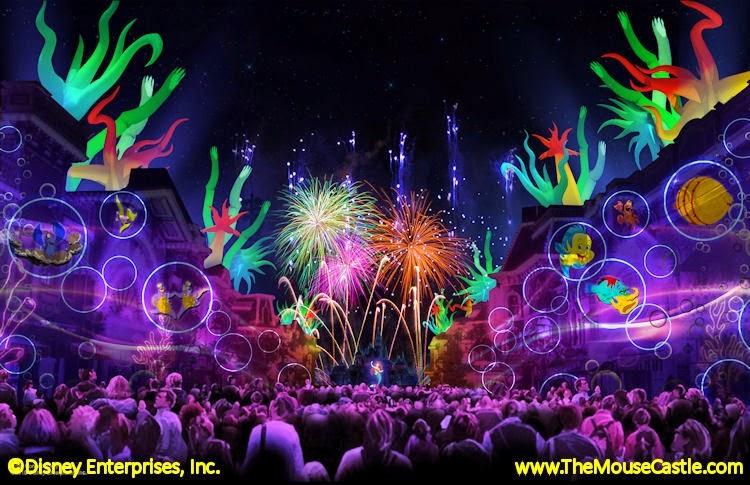 Disneyland announced some of their plans for the upcoming 60th anniversary celebration. New parade...check. New fireworks...check. New World of Color...check. New Hatbox Ghost...wait, what? 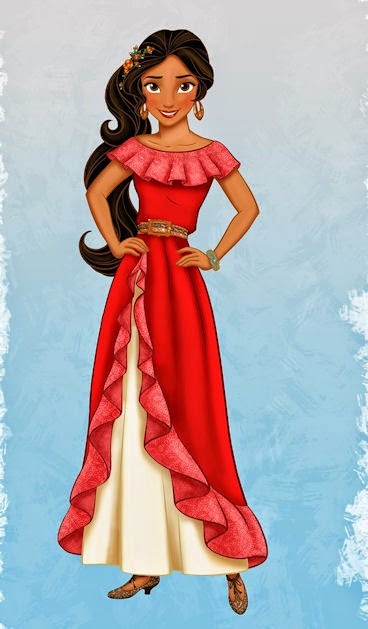 Disney is introducing a new Latina princess. Elena of Avalor will make her debut on the Disney Junior show Sofia the First in 2016 before spinning off into a series of her own. We love the new Disney coffee mugs that are blowing off the shelves at Starbucks locations at Disneyland and Walt Disney World, but a purple mug featuring Epcot's Spaceship Earth and the Monorail has disappeared entirely. We explain why. Want to own a piece of Disneyland history? Van Eaton Galleries in Southern California is auctioning off over 1,000 items from Disneyland's early days. The collection is astounding and includes an original skeleton animatronic from Pirates of the Caribbean, an animatronic bird from Walt Disney's Enchanted Tiki Room, a doll from it's a small world, plus all manner of vintage artwork and ticket media. Items will go on display at the gallery on February 7th and the online and live auction will occur on February 28th and March 1st. Get out your credit cards.